Don’t know much about history? Here’s an accelerated class on 120 years of bomb making and Core creating. These are the histories of the University of Chicago, published in the hope of thereby preserving from decay the remembrance of what Maroons have done, and of preventing the great and wonderful actions of the B-J and Snitchcock Scav teams, the machinations of Enrico Fermi, the star-gazing of Carl Sagan, the prosaic introspection of Saul Bellow, the keen-eyed analyses of Hannah Arendt, and the weary-eyed trudging of shake day devotees from losing their due meed of glory. 255 years younger than Harvard and 190 years younger than Yale, the U of C has done more since 1892 than simply drape itself with ivy in the illusion of competing with the nation’s coastal elites. And as you well know, the Oracle of U.S. News & World Report has taken notice. Our University of Chicago—as it exists today in its neo-gothic and geometric glory—rose a phoenix from the ashes of the “Old” University of Chicago, a failed attempt by Stephen A. Douglas and a group of wealthy Chicagoans to create a Baptist institution of higher education in the Midwest. This early attempt was plagued by difficulties from its very conception: Douglas’ politics scared off many would-be investors (think Kansas-Nebraska Act), debt mounted rapidly, things in Chicago got a little too hot in 1871, etc. After 30 tumultuous years, the school closed its doors in 1886. Yet the Baptists persisted after the first U of C met hellfire—and eventually happened upon a Mr. John D. Rockefeller (Standard Oil magnate and philanthropist extraordinaire) and his wealth to support the new effort. Together they attracted the University’s first president, the educational visionary and Hebrew professor William Rainey Harper (the “Harper Memorial Library” Harper), who in turn attracted even more money from Rockefeller. Soon thereafter, the University of Chicago you know and love (but perhaps that’s a touch premature) was up and running. The new U of C was founded primarily as a research institution, with a very small undergraduate population cast in more of a supporting role. A tuition-driven undergraduate College has its monetary appeals—not, of course, for the undergraduates. Undergrads are very rarely allowed to tinker with self-contained nuclear reactions (except during Scav season) or to run for president, those fabled achievements of illustrious faculty that garner this institution its renown. Thus the relative sizes of the graduate and undergraduate populations long fluctuated in size and support, raising exalted enthusiasm and guffaws of dignified defiance in Hyde Park for decades. Enter Robert Maynard Hutchins. Only 30 years old at the time, Hutchins ascended to the presidency in 1929, a year marked by a core uncertainty regarding the University’s future curriculum. An adamant supporter of a strong undergraduate program, he took steps to build ours into one of the best in the nation. First, amidst a comprehensive restructuring effort, Hutchins created an official administrative division for the College. He also oversaw curricula reforms that laid the great books groundwork for what is today the subject of a love-hate relationship in every undergraduate’s heart: the Core. Incidentally, we also have Hutchins to blame—or praise—for shutting down the U of C’s Big Ten football program. He once lethargically pronounced: “Whenever I feel the urge to exercise, I lie down until it passes,” a prevailing sentiment in Hyde Park. Yet he undertook another controversial endeavor, which, though intended to increase the talent of the undergraduate population, is today largely held responsible for its decline over the next several decades. He created a program that allowed rising high-school juniors to begin their B.A. program at the U of C, essentially intending to poach the best and brightest from around the Midwest. It backfired. Hutchins discovered a fundamental problem: high school juniors are not usually ready for college. He also managed to alienate most college counselors, who stopped sending their students to the U of C. It was also around this time that the University developed a reputation for having a watered-down undergraduate curriculum because students only had to take Core classes. After that debacle, undergraduate admissions plummeted. It is possible with a little imagination to trace the U of C’s history, from its very beginning, through its architecture. The early Neo-Gothic buildings on the main quad—Cobb, Bond Chapel, Swift, Ryerson, etc.—reflect its lofty aspirations: a “German institution with an English campus.” Resolute gargoyles stare down at stone-faced men of letters smoking cigars and contemplating capitalism. 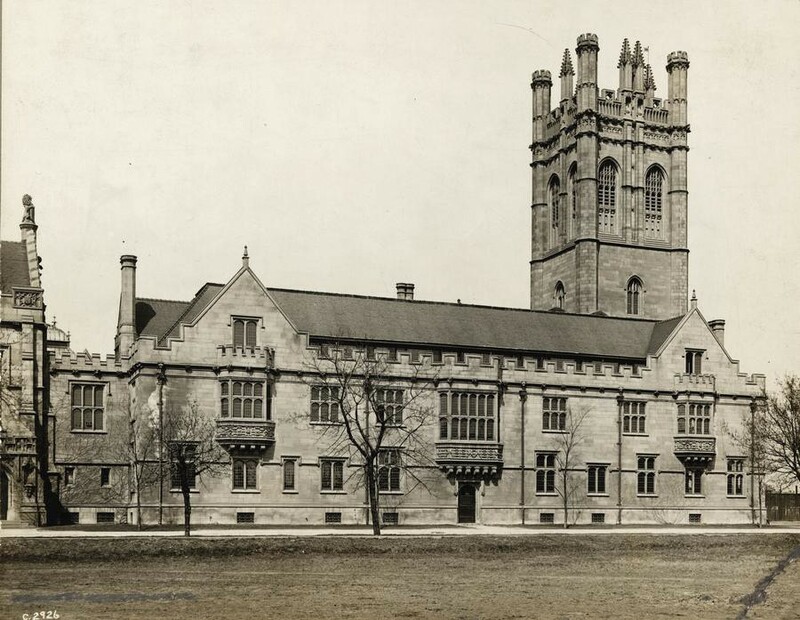 In 1931, under Hutchins’ pro-undergraduate reign, we get Burton-Judson—another impressive but welcoming structure, this time specifically intended to house undergraduate students, calling to the C.S. Lewis buried within every precocious Midwesterner of a certain age. In fact, there was originally a plan to create a whole complex of B-J look-alikes south of the Midway, but that was nixed as too strong an endorsement of undergraduates. Now fast forward about 40 years; undergraduate enrollment goes down and the Brutalist Joseph Regenstein Library goes up. Though like most tragedies its horror has faded with the years—some today might even claim to enjoy its company—the Reg was certainly not designed to grace the cover of brochures sent in the mail. This is also around the same time we get the venerable Henry Hinds Laboratory (that Kafkaesque beehive on Ellis), built, I suspect, primarily for the purpose of trapping unwary undergraduates in its depths. But in the early ’90s a biking bandit (alias: John W. Boyer) burst onto the scene brandishing a beacon of redevelopment for the undergraduate body. Boyer’s tenure as Dean of the College has seen more than just the construction of the disturbingly colorful Max Palevsky and yet-to-be-formally-named South Campus dormitories. He has also revamped the study abroad program and greatly expanded the Metcalf Fellowship program. All with an eye toward insulating the undergraduate population in the warm embrace of academic paternalism. Or, if you prefer, the balmy bubble that is Mansueto Library. And so this is where you enter the tale of the University of Chicago, in the midst of an undergraduate explosion aided largely by the efforts of Dean Boyer, James Nondorf (the University’s new admissions and marketing guru, but you probably know that by now), and the Common Application. You’ve probably already defended your acceptance here with the stats on admissions rates and number of applicants—both record-breaking harbingers of the new era for the College. Yet you will certainly come across arguments that this is a double-edged sword; that the undergraduate population is growing at the expense of its “character.” Take heed. If the “Uncommon Era” at the U of C is endangered, the Class of 2016 may well serve as the fulcrum of revolution.